Why is it difficult for supervisors in the Department of Defense to address poor employee performance? What are promising policies, procedures, and structures for avoiding and addressing poor employee performance? How can the Department of Defense better support its supervisors in managing poor employee performance? In 2017, the Office of Management and Budget (OMB) issued a memorandum that instructed federal agencies to develop actionable, measurable plans to maximize employee performance, including rewards for high performers and penalties for poor performers. At the time of the memorandum's release, the U.S. Department of Defense (DoD) already had changes under way intended to maximize the performance of its civilian workforce, the largest civilian workforce in the federal government at approximately 732,000 appropriated employees and also one of the most diverse in terms of occupations. Recent evidence — specifically, the facts that 25 percent of DoD supervisors reported directly supervising at least one poor performer and that roughly 60 percent of these supervisors agreed that a poor performer would negatively affect the ability of other subordinates to do their own jobs — coupled with OMB's 2017 memorandum, motivated this study. 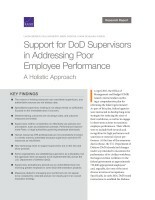 In this report, the authors use interviews with human resources practitioners, survey responses from DoD supervisors, and past research to (1) identify promising policies, procedures, and structures for maximizing employee performance, with emphasis on assisting supervisors of poor-performing personnel, and (2) develop recommendations on how best to support supervisors responsible for managing the poor-performing DoD employees. The framework they present calls for developing, supporting, and professionalizing supervisors in conjunction with assessing and reporting key performance-related outcomes. The volume of training resources can overwhelm supervisors, and authoritative sources are not always clear. Specialized supervisory training is not always timely or sufficiently focused on the immediate concern. Desired training outcomes are not always clear, and outcome measures are limited. Supervisors neither consistently nor effectively use policies and procedures, such as probationary periods, Performance Improvement Plans, and legal authorities governing employee dismissals. Human resources (HR) professionals are not consistently involved in a timely manner, potentially because supervisors perceive HR resources as insufficient. New technology tools to support supervisors are on the rise and show promise. Some organizations are establishing supervision as a discipline, but this approach does not appear to be implemented fully across DoD. Supervisory probationary periods are an underutilized tool now receiving greater emphasis in some DoD demonstration projects. Measures related to managing poor performers do not appear to be consistently collected and are not clearly part of an overall strategy. Decentralized tracking and evaluation make it difficult for leadership to accomplish its implementation and monitoring or identify organizational trends. Many supervisors perceive organizational culture and their leaders as obstacles to removing poor performers. Employees tend to have negative views about how organizations handle poor performers, in part because actions are viewed as sensitive and are not communicated to respect individual rights. Some organizations share outcomes widely at long intervals or a high level of aggregation (strategies to protect individual privacy). Ensure vital performance management principles, such as frequent, regular feedback, are executed. Review and institutionalize performance management policy guidance to improve its comprehension and usage. Develop policy on desired objectives and outcomes for a Manager Support Board. Empower supervisors and HR professionals to make the best use of the full range of support mechanisms available to handle poor performers. Extend and fully implement the requirement to include supervision-related performance elements in performance plans on par with technical elements. Assess and communicate both processes and outcomes related to performance actions. Collect and share best practices in managing poor performers. This research was sponsored by the Office of the Deputy Assistant Secretary of Defense for Civilian Personnel Policy and conducted within the Forces and Resources Policy Center of the RAND National Defense Research Institute, a federally funded research and development center sponsored by the Office of the Secretary of Defense, the Joint Staff, the Unified Combatant Commands, the Navy, the Marine Corps, the defense agencies, and the defense Intelligence Community. Werber, Laura, Paul W. Mayberry, Mark Doboga, and Diana Gehlhaus Carew, Support for DoD Supervisors in Addressing Poor Employee Performance: A Holistic Approach. Santa Monica, CA: RAND Corporation, 2018. https://www.rand.org/pubs/research_reports/RR2665.html.